I became the owner of this tiny beauty a few months back and truth be told whoever sees me wearing this doesn't stop ooh-ing and aah-ing. 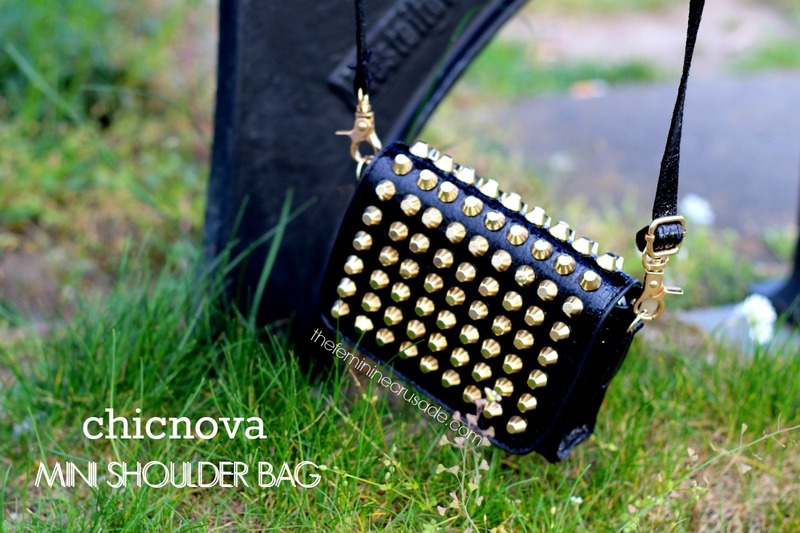 This mini black shoulder bag with gold studded rivets looks very retro. It is made from PU leather fabric and to be honest it does not have the finest of finishes but when all put together nobody notices anything else except how chic it looks. It is fairly small, can fit only a mobile, some cash/cards without a wallet and one or two small makeup items. Its original price is $28.00 which I do think is kinda high considering the size but since currently it is on sale for $21.00, I would say go buy it. It is a stunning piece and I say that not because I got it free, it truly is my most favourite accessory.